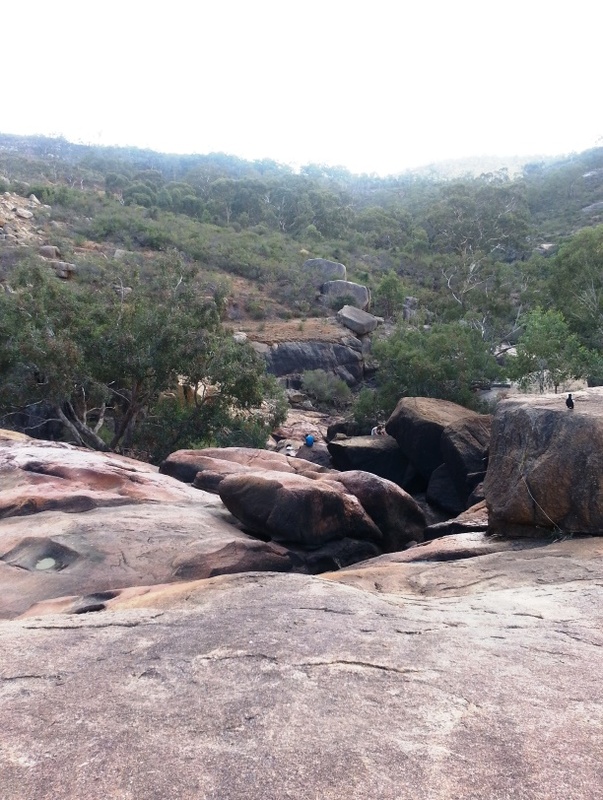 Anth and I went on a bush walk (of sorts) in John Forrest National Park on Saturday afternoon. I was wearing thongs(!) because bush walking wasn't on the agenda when we left home, but I still managed a good 5 or 6 clicks (kilometres) before we ended up in the beer garden of the tavern, (thoughtfully situated in the grounds of the park). It was a sentimental stroll for me, because when I was a kid (back in the day when there was no such thing as an eleven dollar entrance fee!) my family spent nearly every Summer evening there. Mum would pack a picnic dinner and we would eat it in one of the little hand-made huts built by sustenance workers during the depression in the '30's. This after spending hours in the "swimming pool". (read dam here - and looking much more like one these days than it did when I was little! I'm sure the water was clearer and cleaner back then - I wouldn't let my girls swim in it, that's for sure! Not that I'd have to restrain them, I'm sure they'd turn their noses up - I can hear the "ewwww's!" now...these days swimming is prohibited anyway). My littlest sister actually learnt to swim in that 'pool', I still remember her making her way across it, foam turtle strapped to her back. We weren't the only one's either, the place was usually packed with families, making the most of the long, hot Summer evenings. As I mentioned, we ended up at the Wildflower Tavern. This place is not fancy (although the beer is deliciously cold), but if you're ever in Perth on a holiday (or you're a local with kids) and you want to get up close and personal to a kangaroo, this is the place to do it. Cheap, no annoying tour guides, just a cold brew (and a jug of lemon squash for the kids!) and a roo or two. Perfect! 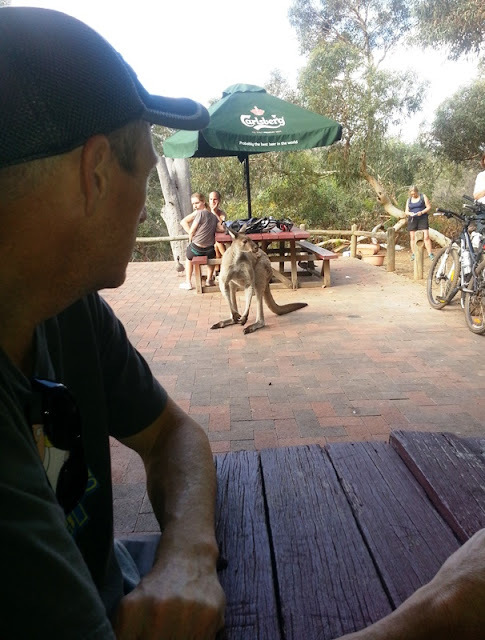 That's Anth in the foreground and that kangaroo (there were a few of them, including a joey) came right up to our table. The kids in the tavern were all over them and they didn't mind a bit. They let them pat them and scratch them behind the ears etc - it was gorgeous! The little boy in thepic below was here on holiday from Ireland, I bet he'll remember that roo for years (his parents took plenty of photos!) I was less enamoured though, with the mother (an Aussie - she should've/would've known better! Surely?) who allowed her daughter to feed the kangaroos potato chips. Helloooo? I really wanted to say something, but I bit my tongue. Some people, right! What a great spot Kylie, never been to that particular spot but might need to go soon! Looks like quite an adventure, especially wearing thongs and not proper shoes! 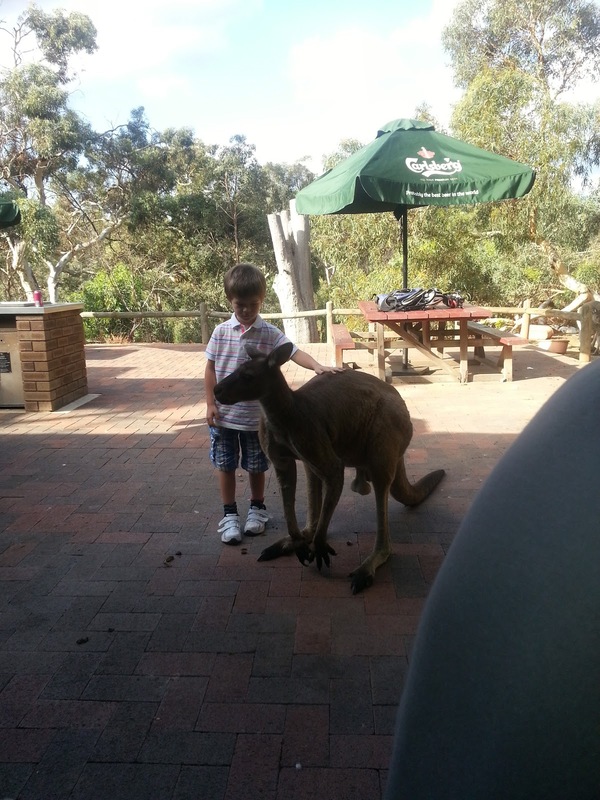 *ouch* What a beautiful place and the kangaroos are cute as well, but feeding wild animals, not good. That's probably why they show up and are so tame though. Hi hi. Thanks for the note about the linkup. Let me look around the place a bit, I think I have just the thing. :) Love the pictures and the kangaroo. Really pretty. Your bush and our bush look kind of the same. Well, feeding the wild life is strictly forbidden most places around here with big signs etc. People would certainly glare and it would drive me so insane I might say something, then I would be uncomfortable I said it and would want to leave sooner then I might have so I guess saying nothing is okay but I do feel for the animals getting that bad food. Silly mom. That looks like such a beautiful spot! I have a particular spot like that in Arkansas where we went on vacations when I was a kid. We loved it so much that my mother did a painting of it back in the day. I'd give anything to have that painting now. Good work hiking in thongs/jandals/flip flops. Mr Asparaguspea likes to do DIY in Birkenstock sandals - he calls them his safety sturdenstocks. It looks a beautiful place, and full of such nostalgic memories for you too. Wow, what a beautiful place, Kylie!! And so exotic to see Kangaroos close up like that, my kids would just love it (me too!!! ) Your piece of the world looks gorgeous, I'd love to go there some day! Wonderful post, so lovely to get a view of something so quintessentially Australian and to hear of your childhood memories. For some reason in my head, the 'bush' was a much more arid space, just sand and rocks. It is really beautiful. I love all your Aussie vocab too. Clicks, that's a new one. Wow !! must put this on my to do list looks bute It was great to hear about your memories, you can't get more Ozzie than the good old Thongs I,ve only explored the east coast so far but W A looks a great place. Looks like a lovely spot. I used to go bushwalking with my dad every weekend as a kid. Similar sort of place, but in south africa, and we would have a braai (bbq) and come up close and personal to some other wild animals a little more scarier! 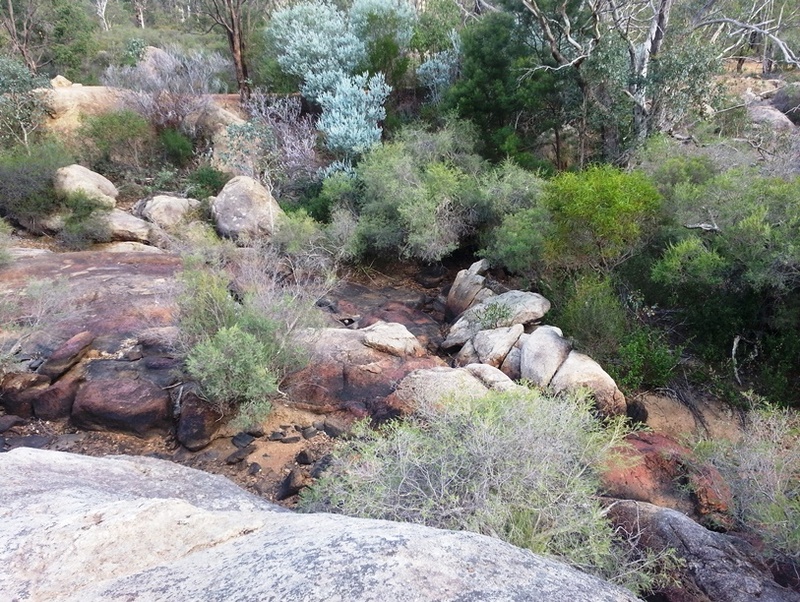 Ooh we love a good bush walk. A bevy at the end sounds like the perfect motivation. As for the roo feeding if I was bold I might have have said to my own children 'noo it's not good to feed the kangaroos chips!!!' Just loud enough for them to hear but probably I would have bit my tongue as well. National Park photos are great! Looks like a beautiful spot and a wonderful day. That kangaroo is absolutely huge! Bush walking in thongs, you crack me up! Spectacular views,but where are the pictures of the dam?? The big roos are quite intimidating aren't they? Hmm, potato chips, not the best idea, not sure if I would say anything either, maybe just loud enough for them to hear indirectly??? Did you buy skippy a beer? Bush walking in thongs - sounds perfectly normal. Looks like a wonderful spot. Did no-one notice or were they to polite to comment on your shadow-shot of Kanga baubles! Thank goodness our's was castrated. I always feel like I'm the last to comment on your posts. I wouldn't have said anything to the mother with the chips. Yes, she's a twit, but there's plenty more where she came from. I saw a pregnant woman smoking the other day ... should I have said something to her? Probably. When we were little and lived on the Gold Coast, sometimes we'd all trek into Surfers Paradise and Mum & Dad would buy us hot dogs and we'd sit on the beach. I'm trying to clean my house as I ponder your linky. oh your pics of WA make my heart so happy. sorry i haven't popped by in a while! BUT, i come bearing good news! i have just listed 4 australia maps in my online shop! the interest has been huge but they still seem to be available so if you're still keen, now is your chance. hope this finds you well and enjoying the aussie autumn temps. the bush is indeed looking grand. love your memories. 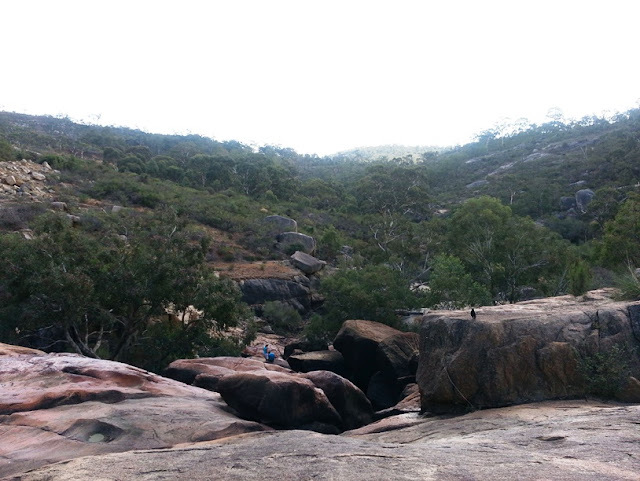 What a beautiful place to hike. Lucky you to grow up nearby. 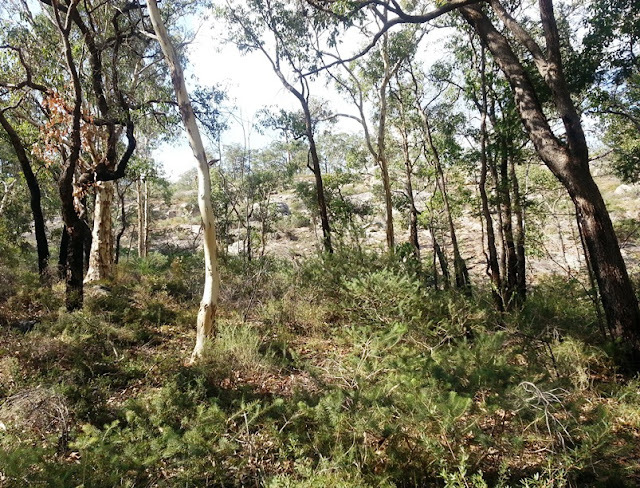 Love the look of your bush-walk. 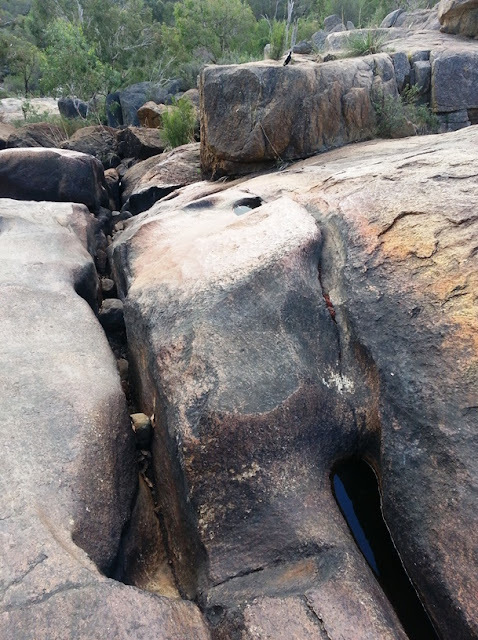 I think there'd be quite a few of us who've ended up bushwhacking in a pair of thongs if we owned up to it! What a lovely spot. I would've chickened-out of saying anything to silly person feeding roos chips too. But the sight of that roo in your pic.....his front legs and shoulders AND claws........I think I would've said something politely to little boy to leave BIG ROO alone for fear of a good whack from him. Breath taking, beautiful pics. 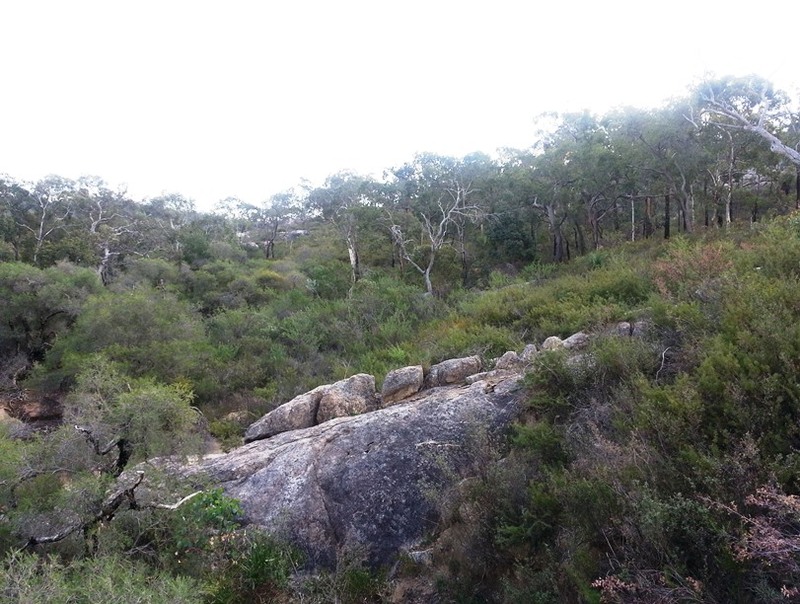 Love bush walking and taking deep breaths, feeling the breeze and standing upright.